Each day is a day of discovery with moments of elation and excitement… at least this is my take away from the past few weeks. Here are a few of Emma’s comments along the way that she gave me permission to post. Dr. C: What has happened to the atomic structure within a black hole? Emma: Opportunity to riot. Structure is chaotic. Dr. C: Basically this is correct. The gravitational pull is so strong that the atomic structure has collapsed. Thus nuclei and electrons are fused together with no space between them. Emma: Just like society during a riot. Dr. C: These societal people have collapsed onto each other to further this analogy. Ariane: So what do you think so far? Emma: Understand that it is a heady play and play on words that pities human rage and love equally. 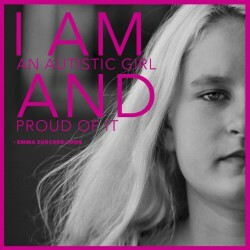 Emma: Because of dissent a culture was born. 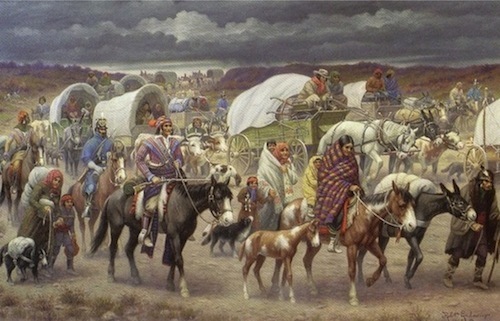 Regarding the Trail of Tears and how the Cherokee were the last tribe to make the grueling 800 plus mile trek to the “Indian Territories” I asked Emma to tell me something about this picture. Emma: Exodus. Forced displacement of people with little choice. It tells something about man’s wish for power. Oppression is an ongoing story.